Mark is a Project Manager at JD Collins Fire Protection and will be stepping into the ring on May 30th to face-off against Robert. How did Mark get involved with #FTEC2015? 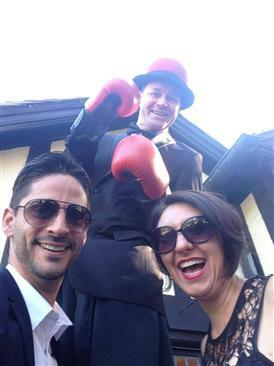 Mark was introduced to the Fight To End Cancer through his wife and her training at Kingsway Boxing Club. “We went to the event last year and was amazed with all the fighters stories…now I’ll be making my own story. Alongside 9 other men and women Mark will step into the ring to show his support for those, such as his mother, who have had to fight cancer. Mark has already beaten his fundraising goal of $5,000 with less than two weeks to go, but he isn’t stopping there! 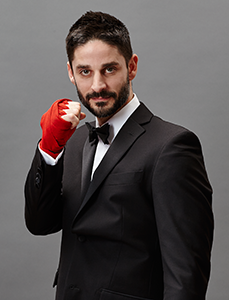 Donations can be made right up until the Fight To End Cancer Gala, so we want to see Mark not only beat, but demolish his goal (you can help by making a donation here). We asked Mark how he is feeling leading up to Fight Night? “Feeling great! Trying to give 200% in training and then the fight will be a breeze. The training has prepared me so I’m feeling confident. I would be lying if i said I wasn’t nervous, it’s not so easy to go into something were you know the other person wants to hit you.